We can arrange UK nation wide and world wide delivery for all or our antique furniture. 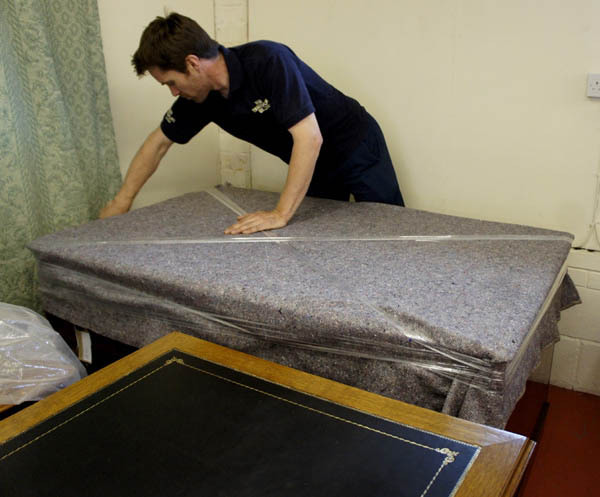 We only use professional furniture delivery companies very experienced in handling antique furniture. Comprehensive insurance is available to cover the total cost of the item + delivery costs. You may choose your own shipping or delivery company if you prefer. There may be additional local taxes or surcharges when the item arrives at your destination. These will need to be paid by you the customer. Please contact us with your address and Post Code if you would like us to help you find the best delivery option for you. I just wanted to write and say how delighted I am with the desk. H&H did a great job on the delivery yesterday and it’s sitting in my newly refurbished study looking very smart. What's the shipping charge for sending a large desk to the USA? 1) The distance your item has to travel to the airport or dock and the onward journey to your address. 2) The size and weight of the item. 3) Whether it is travelling by air or sea and which is closest to the destination. When we have the item details and a delivery address we can let you know the cost within a day or two. We will also let you know the cost of the insurance and usually the time it will take to get the item to you. How do I find out about import taxes and duties? A. A very useful website: Duty Calculators works out the import taxes and duties for a specific item for any country. It has an app you can use 3 times for free then you need to subscribe. who have the appropriate expertise with Customs formalities, in order to make shipping hassle free and easy. Do You Offer Discounts for Overseas Shipping? Yes! Depending on the item we can usually offer a discount to overseas customers. This will help to offset the shipping costs so please ask us. You can pay via Direct Bank Transfer from your bank to ours, by cash or personal cheque. Bank transfer is a simple procedure:; we send you our bank details for you to give to your bank for the transfer of funds. Your bank converts your currency to GBP (pounds sterling) at the time of transfer and informs you of the actual cost to you. Please check bank exchange rate at the time the transaction takes place. Can we use our own shippers or delivery company? For overseas deliveries, we use well-established shipping companies with many years experience of handling antiques. You can od course choose a company yourself if you prefer. 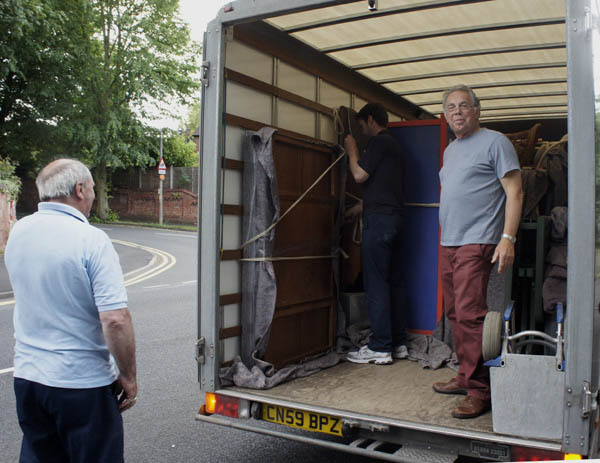 For UK deliveries we sometimes deliver ourselves or use a number of well-established road transport companies experienced in handling antiques. As soon as we receive payment we book the item sin for collection by the shipping company. They will then construct a crate for your item to protect it whilst in tyransit. It is then wrapped and crated and transported to docks or airports to be delivered to its destination. Airfreight is the fasted way to send your item and often cheaper if you live close to an airport than a shipping dock. Also, customs clearance is done while in the air so there are few hold ups at the airport. So you should receive the desk within 5 - 7 days (after it has been packed) depending on how far it has to travel from the airport in the USA. Ocean Freight liners will take your individual created item to any port worldwide. They visit New York and Los Angeles every week. However, it can take between 5 - 12 weeks to reach your destination depending on the route and delays at the dock where containers may be queuing for checks. So please ask about this when making your inquiry. Can I get My Item Any Quicker? Yes. If you opt for Air Freight Premium Service it typically arrives within the week but there is an additional cost for this service. What about any import taxes do I have to pay these? Yes, there are import duties but not with airfreight, these are usually paid in advance. If there are any local taxes, you are liable to pay these when the item is delivered. However, we have not found this to be necessary for antique furniture being sent to Europe and the USA. and we are normally informed if there is liable to be taxed when it arrives in the country of origin. What happens if my antique desk or table is damaged during transportation? This is a very rare occurrence as each item is wrapped and crated individually. However, we do advise customers to take out the insurance in case of any damage or loss during transportation. Extended liability insurance is typically 1% - 2% of the total costs and payable to the shippers if they are arranging this. Details of how to make a claim will be sent to you when the booking is made.